Click Here to Enlarge in a New Window. 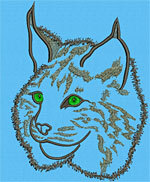 The BobcatPortrait #1 is a great design to show off your love to this magnificent animal. Can be sewn with most home and industrial embroidery machines. We created the Bobcat Machine Embroidery Designs for t-shirts, hats, jackets, pants, pique, fleece, leather and denim garments, hoodies, towels, blankets, tote bags, hand bags, purces, pillows and anything else you can think of. 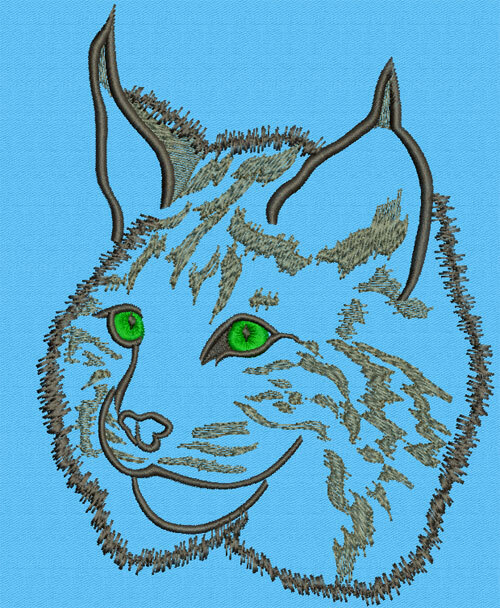 We can convert the Bobcat Wildlife Designs to these embroidery machine formats on request. The Bobcat designs on this page are copyrighted by Vodmochka Graffix and may not be distributed in any format or by any method, either altered or unaltered, without the express written permission of Vodmochka Graffix. By purchasing this design, you acknowledge that you agree to the User License Terms.